The band sounds confident as they play through the dreamy plucking of the guitars, the perfectly enunciated vocals, and that sweet meditative groove that drummer Scott Donaldson brings with him. The tunes are mellow, meditative, groovy, and best of all, heady. As a short release, “Repeater” does what it’s intended to do and offers the hungry fans just a taste of what the main course is going to bring. Bring on that sophomore release! Some bands got it and others don’t. Then there are the bands who get it, whereas others don’t. 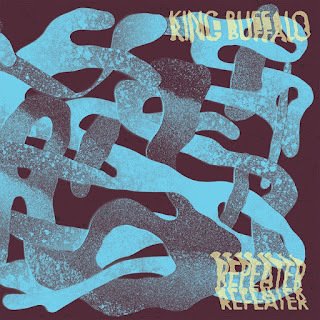 King Buffalo decided years ago to foray into the world of heavy-psych and make a name for themselves. 2013 saw the release of a demo, this was followed up by a split with Le Betre, and then 2016 came at us with their first full length, “Orion.” Over the course of these releases, and certainly on their full length, the Buffalo, New York trio showed that they’ve both got it and get it. Bring in the first week of 2018, and King Buffalo nonchalantly release a new EP, “Repeater.” Comprised of three songs varying in length from 14 minutes, 4 and 6 minutes, this EP is the needed stepping stone to the band’s next full-length. There’s no telling when their sophomore album will drop, but until then, here’s 20 more minutes of new King Buffalo tunes. The first thing that came to my mind when I heard this EP was that it reminded me of Side A of Pink Floyd’s “Dark Side of the Moon.” The way this 1973 classic album quietly opens and flourishes with “Speak to Me/Breathe,” finds solace in an experimental interlude before wailing away with the album’s single, “Time,” “Dark Side of the Moon” is almost one-to-one to the vibe and feel of “Repeater.” And I mean this as a compliment. At a quick 20 minutes, “Repeater” is all packed on to one side of a 12” record. King Buffalo make no qualms in taking their sweet time to let the music unfold. The band sounds confident as they play through the dreamy plucking of the guitars, the perfectly enunciated vocals, and that sweet meditative groove that drummer Scott Donaldson brings with him. The tunes are mellow, meditative, groovy, and best of all, heady. The sprawling 14-minute title track opens things up with a psych-out that travels far and wide. As far as the production goes, it’s impeccable, especially around the 9-minute mark when the guitars start going wild. “Too Little Too Late” brings with it heavier guitars and enough swirl to spin your head around backwards. The song’s hypnotic in its pulsing and zany experimentation, serving up a fitting transition to the EP’s closing track, “Centurion,” which is streaming below. This last song carries with it a vibe that’s more stoned than the opening cut. To put it bluntly, “Repeater” is to wake up to and “Centurion” is for those late hours of the night. These 20 minutes pass by pretty quickly. King Buffalo manages to have this control on time, regardless the length of the release. Case in point, “Orion” still passes me by in the blink of an eye. As a short release, “Repeater” does what it’s intended to do and offers the hungry fans just a taste of what the main course is going to bring. Bring on that sophomore release! ALBUM REVIEW: Greyfell - "Horsepower"
ALBUM REVIEW: Nest - "Metempsychosis"
ALBUM REVIEW: Sinistro - "Sangue Cassia"
ALBUM REVIEW: Vargrav - "Netherstorm"
ALBUM REVIEW: Agrimonia - "Awaken"
ALBUM REVIEW: Druid Lord - "Grotesque Offerings"
ALBUM REVIEW: Tribulation - "Down Below"
ALBUM REVIEW: Wolftooth - "Wolftooth"
ALBUM REVIEW: Witchcryer - "Cry Witch"
ALBUM REVIEW: Somali Yacht Club - "The Sea"
ALBUM REVIEW: Watain - "Trident Wolf Eclipse"
ALBUM REVIEW: Minors - "Atrophy"
ALBUM REVIEW: Possessor - "The Ripper"